3 years ago I had proper Harb foot beds fitted in Holland at Portes Du Ski. This made a difference to my skiing, I wouldn’t say a complete transformation, but afterwards I could ski better on one foot and was able to perform a full weighted release. Before that no chance. I worry though about my static cuff alignment as below. For reference this picture is taken with liners removed but footbeds fitted into shells. If I understand correctly this shows that I’m knock kneed? I’ve adjusted the boot as far as I can with the built in adjustments to try and get an equal gap each side of my shin but this is the best I can achieve, So my question is do I need to have some further boot customisation carried out? I do have some video of me attempting the alignment exercises as laid out on the new alignment video but I thought I should start with the basic cuff alignment issue first. I would appreciate any help you can give as it’s difficult to get good advice here in the uk. You are on the right track to be questioning the cuff alignment. It makes a huge difference in ski performance. Have you purchased the downloadable Alignment Manual to go along with the first alignment video? It goes into a lot more detail about boot fitting than Expert Skier 1, and includes a discussion of anatomy and cuff alignment. You may not be able to solve all of your issues from reading the manual, but it will make you a more informed customer, and will help you ask the right questions. - Do they have cuff adjustments on both the medial and lateral sides? - What canting, if any, do you already have on the boot soles? Adding to the above reply, I have Lange RS 140 boots which only have cuff adjustment on the lateral side. This was not enough adjustment for my right foot, so Harb Ski Systems replaced the medial rivet with a Head cuff adjuster to give dual canting. I don't think this can be done for all brands of boots because it depends on the size of the rivet. Another comment is that many boots have cuffs that are too strong. The fact that you run out of adjustment doesn't mean that you are knock-kneed. Cuff is way too strong. Alignment canting won't fix this. This needs to be done with the canting/cuff adjustment on the boot. Having skied with one boot like this you will notice a huge difference. The good news is that its easy to fix. In my case I needed additional ability to move the cuff which required Diana to put in a different adjustment screw with more range on motion. First max out what your you can with the existing cuff adjustment. Even if you pick up say a centimeter of space it will be way better than the way it is now. Thanks for all the replies, for some reason my notifications haven’t been working so have only just seen that I’ve had these responses which is much appreciated. Have you purchased the downloadable Alignment Manual to go along with the first alignment video? 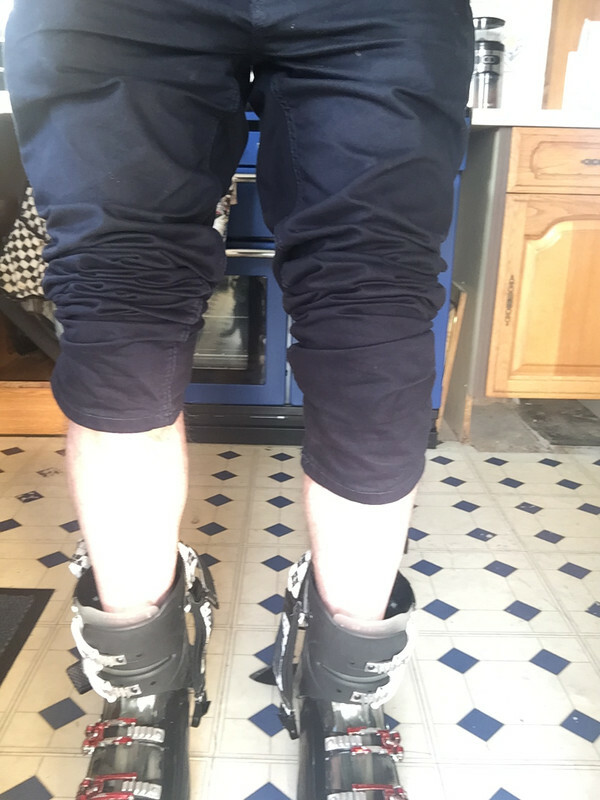 It goes into a lot more detail about boot fitting than Expert Skier 1, and includes a discussion of anatomy and cuff alignment. No, but I will take your recommendation and do so. Boot model is Salomon Impact 10 CS (120 flex). Erik wrote: - Do they have cuff adjustments on both the medial and lateral sides? They have cuff adjustment both sides which I’ve maxed out. i.e. on one side it wound fully CW and on the other fully CCW to pull the cuff over as far as possible. Erik wrote: - What canting, if any, do you already have on the boot soles? I have no canting on soles. jbotti wrote: Cuff is way too strong. Alignment canting won't fix this. This needs to be done with the canting/cuff adjustment on the boot. Having skied with one boot like this you will notice a huge difference. The good news is that its easy to fix. In my case I needed additional ability to move the cuff which required Diana to put in a different adjustment screw with more range on motion. First max out what your you can with the existing cuff adjustment. Even if you pick up say a centimeter of space it will be way better than the way it is now. OK so I think I need different adjustment screws with more range. Should I do this to the medial side, lateral side or both sides equal amounts? "OK so I think I need different adjustment screws with more range. Should I do this to the medial side, lateral side or both sides equal amounts?" Since I have never done it myself I don't know the answer. Someone else here may know. Perhaps they will chime in. Robert0325 wrote: If I understand correctly this shows that I’m knock kneed? I do have some video of me attempting the alignment exercises as laid out on the new alignment video but I thought I should start with the basic cuff alignment issue first. It is not that simple. The general rule is, you get footbeds with proper correction for pronation, then you adjust your cuffs as well as you can, then you get alignment assessed and tested on the snow. Under-sole corrections and cuff corrections work similarly in some ways and differently in others. Sometimes, one can achieve quite good results with underfoot plates even if cuffs cannot be perfectly adjusted (basically, you may end up overcorrecting with the plates to correct for cuffs). Sometimes one has to do further "surgery" on the boots, e.g., install eccentrics with a wider range of motion. Guys at HSS have done such things in the past, but my impression is that they do it when other options fail. Even with their experience, it is often trial and error. HSS is also developing, some 5-10 years ago they were leaving cuffs in neutral position and compensating only with under-sole shims. Cuffs were adjusted only in rare cases. Now they start with cuffs. Alignment is not trivial, it requires both training and practical experience. Your alignment can be estimated from video which you mentioned, but without measurements on the stand and skiing with shims for validation, one cannot tell how much you need and how bad it is that your cuffs are not perfectly aligned to your feet. This exact problem brought me emergently (yes, emergently because strength of cuff against lower leg caused so much knee pain I couldn't ski!) to HSS in Dumont. Diana drilled the inside of my Lange boots to place a cuff adjustment screw sourced from a Head boot. These days I ski in Heads, which allow bilateral cuff canting. HSS just put out a new video which explains (really well) how to do this if the boot has the capability. They do mention that it is possible to get more movement to the inside and show how Becky's boots were modified but don't show how to accomplish it. If you are comfortable with the concept of changing the adjustment screw (and potentially ruining your boots if you mess it up) the video really does a great job of showing what needs to be done. Then redo the videos as indicated in Alignment Video. The need for shims etc or not will then come from that, do you agree? Obrules15 wrote: HSS just put out a new video which explains (really well) how to do this if the boot has the capability. They do mention that it is possible to get more movement to the inside and show how Becky's boots were modified but don't show how to accomplish it. Obrrules 15, thanks for this info, it could be extremely helpful to me, but I've looked on the Harb Ski systems website but can't see the video. Am I Looking in the wrong place? This sounds silly, but did you turn them the correct direction? The camera angle might be deceptive, but your legs look relatively straight, and the cuffs seem to be over (tipping outward) too far. You need to raise the cuff on the outside and lower it on the inside. i agree with ken. which direction have you moved the cuff? to the inside or outside? Yes definitely raised and lowered the right sides. I went both ways just to makes sure. I've since done a modification to the outside rivet to raise the cuff on that side a further 3 to 4mm. That's made all the difference, I now have an even gap each side. I've tested in our indoor ski center and seems that I turn quicker now with a simple lift and tilt of the inside leg. Yes, I think my legs are relatively straight, I'm not particularly knock kneed but my calves do tend to bulge out to the inside which I think was causing the problem.